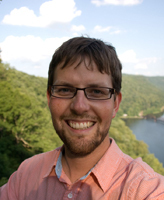 To support his exploration of Appalachian culture and its complex relationship with the coal industry, the National Science Foundation awarded Escher a three-year Graduate Research Fellowship, a highly competitive program that funds research in an array of fields, ranging from sociology and political science to physics and engineering. 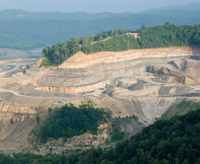 Escher’s dissertation focuses primarily on the social impact of mountaintop removal (MTR) mining, a practice that has become increasingly common, especially in Kentucky and West Virginia. This coal extraction method involves leveling mountains, filling the surrounding valleys with the cleared material, and replacing the native hardwood trees with grasses. He will also closely examine the social psychology of residents and activists on both sides of the issue and the various factors that influence their positions. 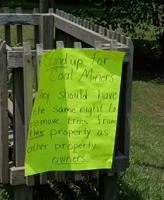 Escher says his initial experiences in the area have already demonstrated that residents who support coal are far more multi-dimensional than opponents to coal or MTR recognize, and he is eager to learn more about this seldom-studied demographic. While living in Appalachia, Escher plans to work or volunteer part time in a setting—such as a mining supply company or surveyor’s office—that lets him observe some of the inner workings of the coal industry and interact with a wide variety of people. Truly immersing himself in the area is a good way to build relationships and trust with residents, says Escher, a native of Washington state. “Many Appalachians are understandably wary—and weary—of talking with outsiders because of a history of being misrepresented by scholars, journalists, and politicians,” he notes. While his research will include measurements such as employment, crime rates, nutritional indicators, social movement organizations, and ecosystem health, Escher’s extended time in residence will also allow him to provide an invaluable look at the people behind those statistics. Escher says he wants to value and appreciate Appalachian residents as people, not merely research subjects or project participants. And his involvement in the area and with its residents is not something he plans to abandon after his thesis is complete. 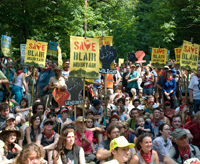 “I intend to remain connected to Appalachia and to issues of energy, environment, and sustainability for many years to come,” he says. Originally published by Joanna Basile at al.nd.edu on August 08, 2011.